The reorder charts are out from Diamond Comic Distributors, and Spider-Man leads both of them. Let's look first at the books that are already out, before moving on to the future. These are items that have already shipped, but have been receiving additional orders from retailers. In most cases below, the items are in stock and so the orders are being filled; occasionally items are back-ordered, so their reorders will enter into the channel once they become available. These are ranked by invoiced dollars, so retailers' discounts have already applied to the totals before ranking. 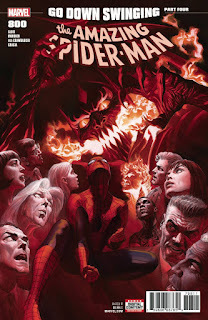 Last week's big release, Amazing Spider-Man #800 was the top reordered comic book. (See listings for the issue on eBay.) The top reordered comic book from DC was the weekly Justice League: No Justice #3. It went on sale on May 23. Marvel had a deep-discount sale on its Marvel Masterworks hardcovers and trade paperbacks that ran from May 17-30; this resulted in eight of the volumes making the Top 25, including the top hardcover for the week, the 2014 printing of Marvel Masterworks: Invincible Iron Man Vol. 1. The top hardcover appearing not as the result of a sale was Dark Days: The Road to Metal from DC. It shipped on May 16. And in what has become nearly boilerplate text here, the Infinity War trade paperback was the top reordered softcover. The links in the table go to the Diamond information pages for each book. These are items that have not yet shipped, but for which the Final Order Deadlines have passed. These reorders, if books are available to fill them, may or may not land in the same shipping month as the books' release weeks, so a book's presence on this chart can mean that an item might make a repeat appearance in Diamond's monthly top-seller charts. 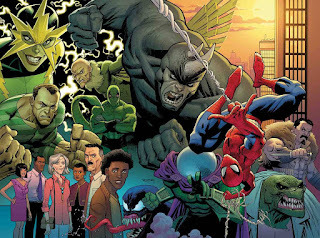 The Fresh Start relaunch Amazing Spider-Man #1 was the top advance reordered comic book. It goes on sale July 11 and is the first July book to appear on the reorder charts. (Check out our new July page. )The 56-page issue has a discount program keyed to retailer's orders of Amazing Spider-Man #796. The top June-shipping comic was Venom #3, which releases June 27. DC's top advance-reordered book was Man of Steel #5, which also releases that day. The top and only trade paperback on the list is Batman Vol. 6: Bride or Burglar. It goes on sale July 25. This chart is ranked by full retail dollars and not units, or wholesale dollars. We've seen enough reorders and advance from the past few weeks from Diamond Comic Distributors to be able to collate some information onto pages for May 2018 and June 2018. And we now have a page for July 2018. Check them out for a further glance at the future. Be sure to follow Comichron on Twitter and Facebook. And check out our YouTube channel!